The assessment of learning is defined as a process whereby someone attempts to describe and quantify the knowledge, attitude or skills possessed by another. Teacher direction is paramount and the student has little involvement in the design or implementation of the assessment process in these circumstances. The assessment for learning involves increased level of student autonomy, but not without teacher’s guidance and collaboration. There is more emphasis towards giving useful advice and feedback to the student and less emphasis on the giving of marks and the grading function. The assessment as learning is perhaps more connected with diagnostic assessment and can be constructed with more of an emphasis on peer learning. It is the assessment that is done where Blended learning, E-Learning and Applied Learning take place. Assessment as learning generates opportunities for self-assessment and peer assessment. Students take on increased responsibility to generate quality information about their learning and that of others. The assessment in learning places the question at the centre of teaching and learning. Assessment in learning takes place when open-ended learning and creativity increases. It deflects the teaching from its focus on a ‘correct answer’ to a focus on ‘a fertile question’. Through enquiry students engage in processes that generate feedback about their learning, which come from multiple sources and activities. It contributes to the construction of other learning activities, line of enquiry and the generation of other questions. The purpose of each assessment strategy needs to be understood by students and teachers. The overall assessment ‘package’ being used by learners and teachers should accurately capture, generate and use meaningful learning information to generate deep learning and understanding. Let’s study the innovation done at Chitkara International School which is the intellectual property of the school in detail. These just not include the pen and paper tests but various other ways of knowing how well the child has mastered a particular concept which also includes the Open –book examination, Open-web Examination, The Revision through teaching sessions (RTT S), Knowledge polish, Thinking out of the box questionnaires, word-wall, Brain work, word web, word searches etc. 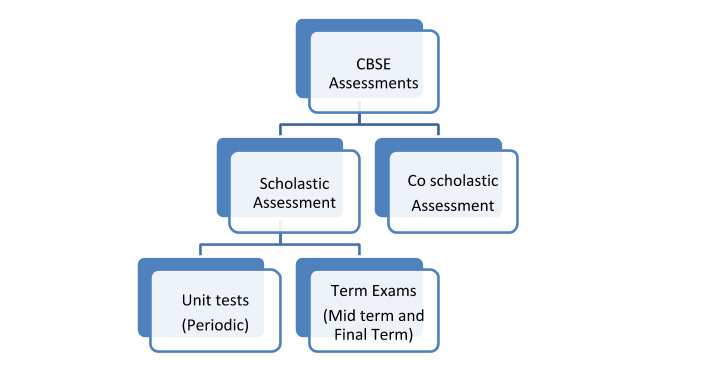 Also, CBSE’s Unit Tests and Term Exams are significantly part of the assessment Blueprint but all the above formats are very well integrated in the system. Moreover, various software are used to assess child diagnostically to ascertain his /her true score statistically. Most of the assessment has a base in the Classical Test Theory(CTT) or Item response Theory (IRT) which themselves are a revolution in education. These involves the non-scholastic areas of learning such as dance, music,school clubs, various squads, health, personality, attitude, social, values etc. which are very much embedded into the study of knowing the child as a whole. The aspect of regularity, sincere participation, output and teamwork is the generic criteria for grading the co-scholastic activities like Work Education, Art Education and Health and Physical Education. Apart from this, the students are also assessed for the discipline which is based on the factors like attendance, sincerity, behaviour, values, tidiness, respectfulness for rules and regulations, attitude towards society, nation and others. Also, feedback form and reporting formats have been designed uniquely keeping the psychology of the learner in mind. Unit Test is a tool used by the teacher to continuously monitor student progress in a supportive environment. It involves regular descriptive feedback, a chance for the student to reflect on his/her performance, take advice and improve upon it. It provides a platform for the active involvement of students in Learning. It recognizes the profound influence that tests have on the motivation and self-esteem of students, both of which are crucial influences on learning. It encourages students to understand the criteria that will be used to judge their work. It offers an opportunity to students to improve their work after they get the feedback. Term Exam is carried out at the end of a course of learning. It measures or ‘sums-up’ how much a student has learned from the course. The paper-pencil tests are basically a onetime mode of assessment and to exclusively rely on it to decide about the development of a student is not only unfair but also unscientific. They are taken by students at the end of a unit to demonstrate the “sum” of what they have or have not learned. Term Exams are the most traditional ways of evaluating students’ work. Chitkara International School provides its students with a competitive platform in the form of skill based testing by conducting national and international level Olympiads, quizzes, competitions, MaRRS spelling bee etc. thus covering all the subjects. The school ensures parallel teaching and practice of the competitive exams and its know- how along with the regular subject study. This is just a supplementary way of assessing a child. They largely assess the skill and area of knowledge of the student. They are standard quantitative way of measuring student knowledge at larger platform.